Continuity mistake: When Cat fills up the cupcake tray it is very messy with cupcake batter all over the tray but when he closes the tray it is clean and perfect with the batter in each cupcake holder perfectly. Continuity mistake: At the end of the movie when the Cat finished cleaning up the mess and was packing Thing 1 and Thing 2, everything looks immaculate except in one scene, in the corner of the living room, there are still purple splashes. Cat in the Hat: Well, there are two treatments I'd reccomend. One is a series of painful shots injected into your abdomen and kneecaps and the other involves a musical number. Cat in the Hat: Here she is. The Super Luxurious Omnidirectional Whatchamajiggar. Or S.L.O.W. For short. Cat in the Hat: Yeah, S.L.O.W. It's better than the last thing we had. Super Hydraulic Instantaneous Transporter. Cat in the Hat: Quick! To the S.L.O.W.! Question: What year is this film set in? The clothing and architecture don't make it clear. Is it meant to be timeless? Chosen answer: Theodor Seuss Geisel, or Dr. Suess as we know him, published most of his books between the late 1930's and the late 1980's. "The Cat in the Hat" was first published in 1957. Dr. Seuss' works generally tell the stories of fantastical characters in imaginary places, meant to be timeless. Illustrations and animated adaptations show buildings and objects with unusual proportions, odd shapes and bizarre functions. 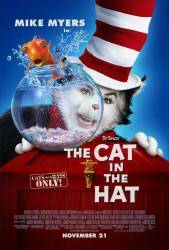 The live action film of "The Cat in the Hat, " however, is rooted to reality by its decidedly human child protagonists in an ordinary house in an ordinary neighborhood. The production design, costume design and set decoration of the 2003 film seem also to have the goal of achieving a certain timelessness. No date reference is given. However, there a decidedly stylized quality of 1950's-1960's suburban architecture and design, complete with its generic forms, chimneys, picket fences, and colors such as yellows and avocado greens, reflecting the common decor of the time. Similar to the 1971 TV short, which seems to provide a reference point for the design aesthetic of the film, nothing appears exceedingly futuristic nor rooted in period styles like victorian or colonial. I have also posed your question to Rita Ryack, the film's costume designer, whom I found on Facebook. If she sees my questions and decides to respond, I will add her insights to this answer.